Celtic Symholism: "Ocean Blessings & Sea Prayers"
I found some curious examples of “Ocean Blessings & Sea Prayers” on the collection of folk poetry from the Western Isles of Scotland: Carmina Gadelica – Hymns and Incantations -Ortha Nan Gaidheal – Volume I -by Alexander Carmichael - . Carmichael spent years collecting folklore from the vanishing cultures of Scotland. The poems in this volume include prayers, invocations, blessings and charms. English translations are done by the author, and the beautiful initials from the first edition. They are a synthesis of Christian and pre-Christian belief systems. All rights reserved by the author. SEA prayers and sea hymns were common amongst the seafarers of the Western Islands. Probably these originated with the early Celtic missionaries, who constantly traversed in their frail skin coracles the storm-swept, strongly tidal seas of those Hebrid Isles, oft and oft sealing their devotion with their lives. Before embarking on a journey the voyagers stood round their boat and prayed to the God of the elements for a peaceful voyage over the stormy sea. The steersman led the appeal, while the swish of the waves below, the sough of the sea beyond, and the sound of the wind around blended with the voices of the suppliants and lent dignity and solemnity to the scene. STIURADAIR Beannaicht an long. HELMSMAN Blest be the boat. SGIOBA Beannaicheadh Dia an t-Athair i. CREW God the Father bless her. SGIOBA Beannaicheadh Dia am Mac i. CREW God the Son bless her. SGIOBA Beannaicheadh Dia an Spiorad i. CREW God the Spirit bless her. SGIOBA Cha ’n eagal duinn ni. CREW No harm can befall us. SGIOBA Cha churam dhuinn ni. CREW No anxiety can be ours. There are many small oratories round the West Coast where chiefs and clansmen were wont to pray before and after voyaging. An interesting example of these is in the island of Grimisey, North Uist. The place is called Ceallan, cells, from ‘ceall,’ a cell. There were two oratories within two hundred yards of one another. One of the two has wholly disappeared, the other nearly. The ruin stands on a ridge near the end of the island looking out on the open bay of Ceallan and over the stormy Minch to the distant mountains of Mull and Morven. The oratory is known as ‘Teampull Mhicheil,’ the temple of St Michael. Le d’ chomh-chomhnadh, O! a Spioraid Naoimh. A stoirm a bha mor, a doinne bha trom. ’S treoirich an sith sinn gu ceann-crich ar n-uidhe. Nach deanadh gniamh fabhtach dhuinn. With thy co-assistance, O! Holy Spirit. From the gale that was great, from the storm that was heavy. And lead us in peace to the end of our journey. With winds mild, kindly, benign, pleasant. That would do no harmful deed to us. According to Thine own will and word. Celtic Symbolism: "Night and Sleep Blessings"
I found these curious examples of “Night Prayers and Blessings” on the collection of folk poetry from the Western Isles of Scotland: Carmina Gadelica – Hymns and Incantations -Ortha Nan Gaidheal – Volume I -by Alexander Carmichael - . Carmichael spent years collecting folklore from the vanishing cultures of Scotland. The poems in this volume include prayers, invocations, blessings and charms. English translations are done by the author, and the beautiful initials from the first edition. They are a synthesis of Christian and pre-Christian belief systems. All rights reserved by the author. THE night prayers of the people are numerous. They are called by various names, as: ‘Beannachadh Beinge’–Bench-Blessing, ‘Beannachadh Bobhstair’–Bolster Blessing, ‘Beannachadh Cluasaig’–Pillow Blessing, ‘Beannachadh Cuaiche’–Couch Blessing, ‘Coich Chuaiche’–Couch Shrining, ‘Altachadh Cadail’–Sleep Prayer; and other terms. Many of these prayers are become mere fragments and phrases, supplemented by the people according to their wants and wishes at the time. It is touching and instructive to hear these simple old men and women in their lowly homes addressing, as they say themselves, ‘Dia mor nan dui, Athair nan uile bheo,’ the great God of life, the Father of all living. They press upon Him their needs and their desires fully and familiarly, but with all the awe and deference due to the Great Chief whom they wish to approach and to attract, and whose forgiveness and aid they would secure. And all this in language so homely yet so eloquent, so simple yet so dignified, that the impressiveness could not be greater in proudest fane. Gach aon ta gabhail tamh an seo an nochd. An oidhche nochd ’s gach aon oidhche. Is fuadaich uam mo namh. O ’n uair ’s gu uair mo bhais. And drive from me mine enemy. From this hour till the hour of my death. An cluanas Spioraid foir nam feart. Ole no fhiamh laighe liom. Is laighidh Teoiridh mo chaoimh a sios liom. In the fellowship of Christ, son of the Virgin of ringlets. In the fellowship of the Spirit of powerful aid. Sin nor sin’s shadow lie down with me. A Dhe nan gras a dhuisgeas mi! Is na h-eireadh dhomh beud no cron. Moch agus anmoch, oidhche agus latha. O God of Grace, that I in peace shall waken. That no harm, no evil shall me befall. Early and late, night and day. Is nach cuireadh an cul rium fein. Mo ghleidheadh an nochd ’s gach uair. The Autumn Equinox or Harvest Home is also called Mabon, pronounced ‘MAY-bon’, after the Welsh god Mabon ap Modron, which means literally ‘son of mother’,the Feast of the Ingathering, Meán Fómhair or Alban Elfed (in Neo-Druidic traditions). Mabon appears in ‘The Mabinogion’ tale. The Druids call this celebration, Mea’n Fo’mhair, and honour The Green Man, the God of the Forest, by offering libations to the trees. The Welsh know this time as ‘Alban Elfed’, meaning ‘light of autumn’. It is basically a ritual of thanksgiving for the fruits of the earth and a recognition of the need to share them to secure the blessings of the Goddess and the God during the winter months. 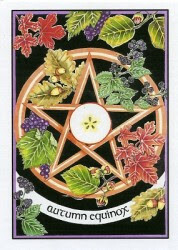 Mabon is considered a time of the Mysteries.It is a time to be thankful for friends and family and knowing there is enough food to last through the cold winter months. It is a time to honor Aging Deities and the Spirit World. Considered a time of balance, it is when we stop and relax and enjoy the fruits of our personal harvests, whether they be from toiling in our gardens, working at our jobs, raising our families, or just coping with the hussle-bussle of everyday life. The triple Goddess is now in her aspect of the ageing Goddess and now passes from Mother to Crone, until she is reborn as a youthful virgin as the wheel of nature turns. At the Autumn equinox the goddess offers wisdom, healing and rest. In the northern hemisphere this equinox occurs anywhere from September 21 to 24. In the southern hemisphere, the autumn equinox occurs anywhere from March 20–23. Among the sabbats, it is the second of the three pagan harvest festivals, preceded by Lammas/Lughnasadh and followed by Samhain. This is the point of the year when once again day and night are equal – 12 hours, as at Ostara, the Spring Equinox. The Latin word for Equinox means ‘time of equal days and nights’. After this celebration the descent into winter brings hours of increasing darkness and chiller temperatures. It is the time of the year when night conquers day. After the Autumn Equinox the days shorten and nights lengthen. To astrologers this is the date on which the sun enters the sign of Libra, the scales, reflecting appropriately the balanced day and night of the equinox. This was also the time when the farmers brought in their harvested goods to be weighed and sold. This is the second festival of the season of harvest – at the beginning of the harvest, at Lammas, winter retreated to his underworld, now at the Autumn equinox he comes back to earth. For our Celtic ancestors this was time to reflect on the past season and celebrate nature’s bounty and accept that summer is now over. Harvest Home marks a time of rest after hard work, and a ritual of thanksgiving for the fruits of nature. This is the time to look back on the past year and what you have achieved and learnt, and to plan for the future. The full moon nearest to the Autumn Equinox is called the Harvest Moon and farmers would harvest their crops by then, as part of the second harvest celebration. Mabon was when livestock would be slaughtered and preserved (salted and smoked) to provide enough food for the winter. There was a Celtic ritual of dressing the last sheaf of corn to be harvested in fine clothes, or weaving it into a wicker-like man or woman. It was believed the sun or the corn spirit was trapped in the corn and needed to be set free. This effigy was usually burned in celebration of the harvest and the ashes would be spread on the fields. This annual sacrifice of a large wicker man (representing the corn spirit) is thought by many to have been the origin of the misconception that Druids made human sacrifices. In some areas of the country the last sheaf was kept inside until the following spring, when it would be ploughed back into the land. In Scotland, the last sheaf of harvest is called ‘the Maiden’, and must be cut by the youngest female in attendance. Corn dollies were also made from the last sheaf and kept in the house to protect the inhabitants from bad spirits during the long winter. To honour the dead, it was also traditional at Mabon to place apples on burial cairns, as symbolism of rebirth and thanks. This also symbolizes the wish for the living to one day be reunited with their loved ones. Mabon is also known as the Feast of Avalon, deriving from the meaning of Avalon being, ‘the land of the apples’. Rituals to celebrate Mabon can have a dual focus, or choose just one aspect: feasting and thanksgiving for harvest, or recognition that the Year’s Wheel is turning towards winter. Celebrate this harvest aspect before your feasting meal by blessing the loaf of bread. The head of the household should break off a piece while thanking the Earth for Her gifts; this first piece should go on a special dish for offering. As the host serves each dish, the first spoonful should go on this dish to offer the gods. Bless each dish to the guests’ health as it is passed, and be sure to have a toast! Another way to recognize the darker aspects of the day would be to hold a Falling Leaves ritual out doors. Take an offering of grains and vegetables out to a large tree, preferrably an oak that is beginning to color and lose its leaves. Speak about the Wheel as reflected in the life of the tree in Spring the first new signs of life appear, moving into maturity at summer, then to ripe acorns in late summer, now to dying as acorns and leaves fall, and the tree will “die” and slumber under Winter’s cold before beginning again in early Spring. At ritual’s end, have the children gather a few favorite leaves to press between waxed paper with an iron(parents, supervise the ironing! ); cut around leaves and hang in the child’s window. I found this curious example of Moon Worship on a collection of folk poetry from the Western Isles of Scotland: Carmina Gadelica – Hymns and Incantations -Ortha Nan Gaidheal – Volume I -by Alexander Carmichael - . Carmichael spent years collecting folklore from the vanishing cultures of Scotland. The poems in this volume include prayers, invocations, blessings and charms. English translations are done by the author, and the beautiful initials from the first edition. They are a synthesis of Christian and pre-Christian belief systems. “THIS little prayer or invocation is said by old men and women in the islands of Barra. When they first see the new moon they make their obeisance to it as to a great chief. The women curtsey gracefully and the men bow low, raising their bonnets reverently. The bow of the men is peculiar, partaking somewhat of the curtsey of the women, the left knee being bent and the right drawn forward towards the middle of the left leg in a curious but not inelegant manner. The fragment of moon-worship is now a matter of custom rather than of belief, although it exists over the whole British Isles. Bright white Moon of the seasons. It is interesting to refer some theories that conceive the term “Caim” as a Gaelic rendering of the biblical male character Cain. In at least one translation this is rendered “from the evil one”, while others have “of the evil one.”Other authors consider Caim a ‘Prince’ of Hell and depict him as a man wearing rich and elegant clothes, and the head and wings of a blackbird. We should quote also that in the predominantly Welsh-speaking regions of Wales (Gwynedd, Dyfed and Ynys Mon), Cain, Caio, Caim and Cail are commonplace first names for males. These names are derivatives of an ancient Welsh name “Cai” which is recorded in the book of Welsh folklore called the Mabinogion. 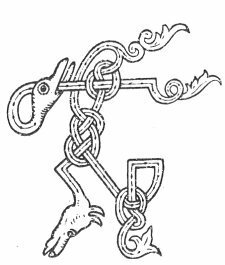 In contrast in pre-Christian Celtic culture of Wales, Scotland and Ireland embodied in the Mabinogion, “Caim” was considered a protective spirit. Unluckily the introduction of Christianity in these regions gave rise to the abandonment or demonisation of traditional Celtic and Druid spirits or their incorporation into early Celtic Christian worship. It is a technique certainly pre-Christian used to draw an invisible circle around yourself with your right index finger by extending your arm towards the ground and turning clockwise with the sun. In other words, wherever we walk, God is with us, a reminder of God’s presence and protection, a symbol of the encircling love of God. Keep light within, keep darkness out. An early document which is silent concerning Patrick is the letter of Columbanus to Pope Boniface IV of about 613. Columbanus writes that Ireland’s Christianity “was first handed to us by you, the successors of the holy apostles”, apparently referring to Palladius only, and ignoring Patrick. Writing on the Easter controversy in 632 or 633, Cummian—it is uncertain whether this is the Cummian associated with Clonfert or Cumméne of Iona—does refer to Patrick, calling him our papa, that is pope or primate. Two works by late seventh-century hagiographers of Patrick have survived. These are the Writings of Tírechán, and Vita sancti Patricii of Muirchu moccu Machtheni. Both writers relied upon an earlier work, now lost, the Book of Ultán. This Ultán, probably the same person as Ultan of Ardbraccan, was Tírechán’s foster-father. His obituary is given in the Annals of Ulster under the year 657. These works thus date from a century and a half after Patrick’s death. Muirchu records much the same information, adding that “[h]is mother was named Concessa.” The name Cothirtiacus, however, is simply the Latinized form of Old Irish Cothraige, which is the Q-Celtic form of Latin Patricius. The Patrick portrayed by Tírechán and Muirchu is a martial figure, who contests with druids, overthrows pagan idols, and curses kings and kingdoms. 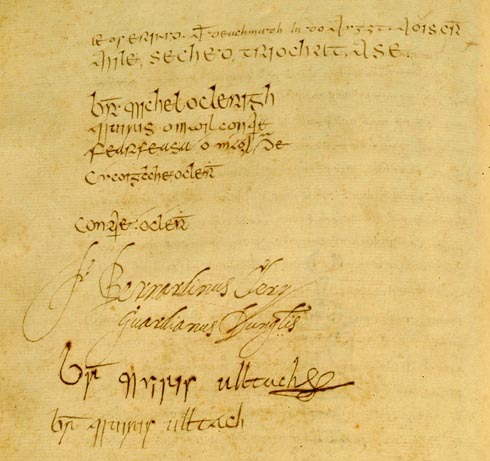 On occasion, their accounts contradict Patrick’s own writings: Tírechán states that Patrick accepted gifts from female converts although Patrick himself flatly denies this. However, the emphasis Tírechán and Muirchu placed on female converts, and in particular royal and noble women who became nuns, is thought to be a genuine insight into Patrick’s work of conversion. Patrick also worked with the unfree and the poor, encouraging them to vows of monastic chastity. Tírechán’s account suggests that many early Patrician churches were combined with nunneries founded by Patrick’s noble female converts. 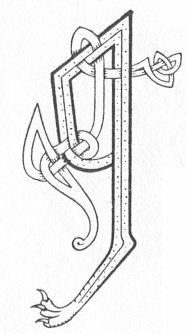 The martial Patrick found in Tírechán and Muirchu, and in later accounts, echoes similar figures found during the conversion of the Roman Empire to Christianity. It may be doubted whether such accounts are an accurate representation of Patrick’s time, although such violent events may well have occurred as Christians gained in strength and numbers. Much of the detail supplied by Tírechán and Muirchu, in particular the churches established by Patrick, and the monasteries founded by his converts, may relate to the situation in the 7th century, when the churches which claimed ties to Patrick, and in particular Armagh, were expanding their influence throughout Ireland in competition with the church of Kildare. In the same period, Wilfred, Archbishop of York, claimed to speak, as metropolitan archbishop, “for all the northern part of Britain and of Ireland” at a council held in Rome in the time of Pope Agatho, thus claiming jurisdiction over the Irish church. The non-residence of snakes in the Isle of Thanet was accounted for by the special blessing of St Augustine, who landed there on his mission to the Saxons. So also tradition ascribed the Irish deliverance to the blessing of St Patrick. Yet, while Giraldus evidently treats the story as a fable, St. Colgan felt compelled to “give it up.” Ancient naturalists relate that Crete was preserved from snakes by the herb Dittany driving them away. Being a Romano-Briton , Patrick was captured by the irish when he was young and driven to Ireland. During the six years of Patrick’s captivity he acquired a knowledge of the Celtic tongue which he would later use. Also during this time, as Milchu his master was a high druid, the young Patrick became familiar with the details of the aboriginal Irish religions. 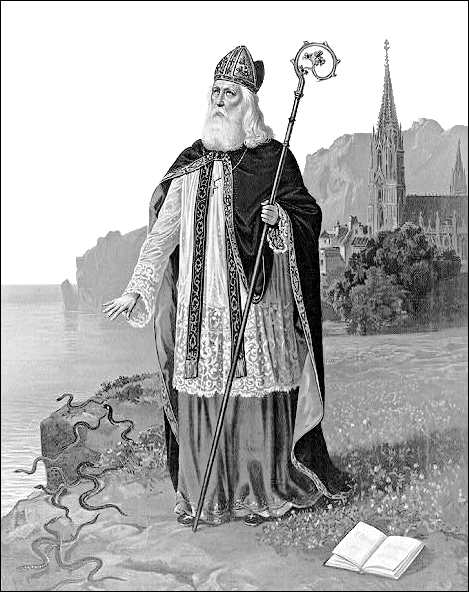 St. Patrick spent his life bringing Christianity to the people of the Emerald Isle and dispelling what he considered to be false traditions of the Irish, which would include the reverence for serpents. 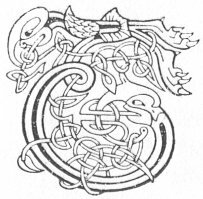 But not all of Celtic and pre-Celtic beliefs and myths, including those about serpents disappeared. St. Bernard, in his Life of Malachy, referred to the Irish of the 12th century C.E. 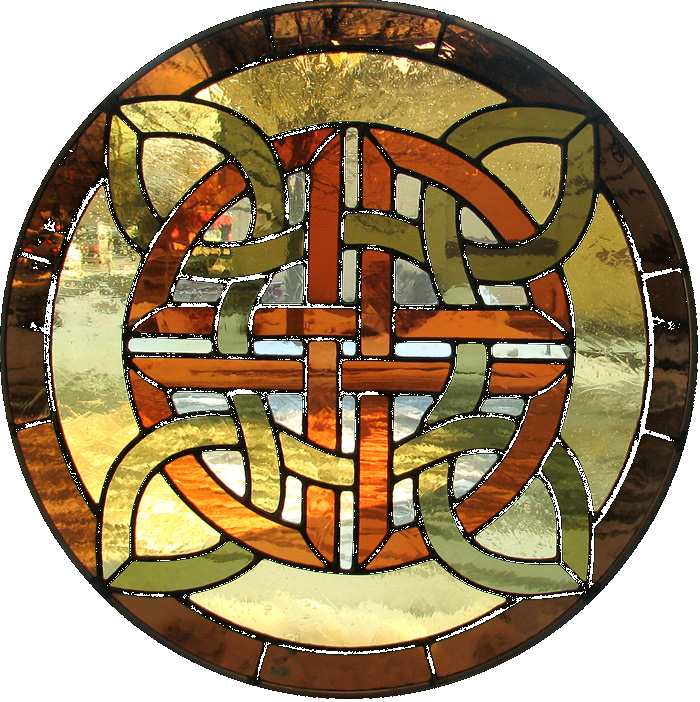 as “Pagans, while calling themselves Christians.” The Irish are still noted for retaining much of the old religion in their Christianity and artistry to this day. The Christian missionaries would have been disgusted by the folk beliefs of the Irish and would have tried to banish such beliefs from Ireland. The Celts, and pre-Celts were animists who believed in many spirits and deities. They believed that spirits dwelled in nature, such as mountains, trees and streams, and had local shrines for worshipping their nature deities. The early Celts of Ireland focused on deities of the local landscapes and animals (which would not have included snakes, but which beliefs may have been borrowed from Britain and Europe). While Ireland was an Island, it was not remote from Europe and much trafficking of ideas transpired. 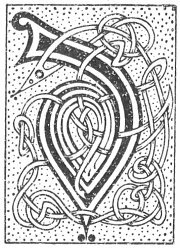 Serpent devotion and symbolism was found in the pan-Celtic religion from Britain and Europe, which would have been imported to Ireland. Snakes in this pan-Celtic context were believed to be fertile, destructive, powerful, and self-regenerative — all magical qualities worthy of emulation. 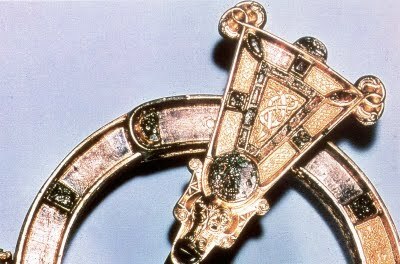 The Druidical serpent of Ireland is perceived in the Tara brooch, popularized to the present day. Irish crosses, so to speak, were alive with serpents. And even in the plates of the Book of Dorrow. An old tradition is held that Niul, the fortunate husband of Pharaoh’s daughter Scota, had a son, Gaoidhial, who was bitten by a serpent in the wilderness. Brought before Moses, he was not only healed, but was graciously informed that no serpent should have power wherever he or his descendants should dwell. As this hero, of noble descent, subsequently removed to Erin, that would be sufficient reason for the absence of the venomous plague from the Isle of Saints. St Patrick wasn’t the only one! He had more saintly competitors for the glory of reptile expulsion supported by popular believes. 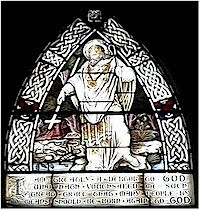 St. Kevin, the hero of the Seven Churches of Wicklow, is stated to have caused the death of the last Irish serpent, by setting his dog Lupus to kill it. This event was commemorated by a carved stone placed under the east window of Glendalough Cathedral, delineating the struggle between Lupus and the snake. This stone was stolen by a visitor on the 28th of August, 1839. 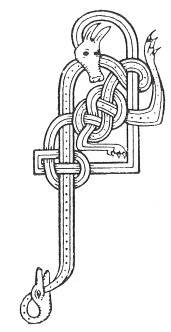 Again, the gallant conqueror of, or conquered by, the Irish Danes, King Brian Boroimhe (aka Brian Boru), we are assured by an ancient MS., had a famous son, Murchadh, who destroyed all serpents to be found in Ireland. This is mentioned in the Erse story of the Battle of Clontarf. St. Cado, of Brittany, was an expeller of serpents from Gaul; and Doué de Gozon expelled them from Malta. Even Colomba did the same good service for Iona, as others of his disciples did for Donegal. On the tombstone of the Grand Master of Malta, 1342, are the words, Draconis Extinctor. Among the heroes of serpent-destroyers were also St. Clement, the vanquisher of the Dragon of Metz; St. Marcel, the deliverer of Paris from the monster; and St. Romain, whose exploits were immortalized over the gargouille of Paris, not to speak of German, Spanish, Russian, and other Saints–Michael. Irish Catholic Celtic monks, ca. 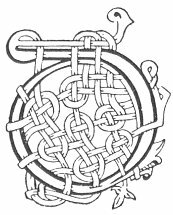 800 C.E., also famously used Celtic art with decorative serpents to embellish the detailed illuminated Latin New Testament manuscripts such as the Book of Kells. 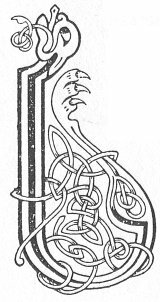 Irish Christian art and architecture is filled with drawings of serpents and snakes. If, as some have speculated, the Tuatha De Danann, the Irish mythological pre-Christian kingly race, were descended from the Israelite Tribe of Dan, then the serpent would have been associated with the people of Danann. The Israelite Tribe of Dan, also Dann, used the serpent to symbolize their tribe from ancient times.